I have always been a fan of the UFC games from the original release of UFC 2009 on the 360 by THQ, and since then I have owned all of them as soon as they were released. My love for the games became even more in 2014 when the license for the games got given to EA with the release of EA Sports UFC. That game gave the fast pace action of UFC with the controls and graphics of the legendary fight night series. So, you can believe when a sequel was released in 2016 I pre-ordered it as soon as possible, and after two years I can say I have 90% of the achievements and over seven days’ worth of playing time in that game. I can also say that the sequel has become one of my friends and my favourite party game and a favourite in my student halls due to the fast-paced action. Well, it has been two years and as the famous Bruce Buffer would say IT’S TIME!! For the 3rd instalment of this franchise. This game has had a good time since the last instalment with it being released almost two years since UFC 2 as well as a closed and open beta for players to test and give feedback in November. Therefore, as expected this game improves from the previous instalments in almost every aspect of the game. However, in a gaming year where fighting games have evolved with big releases and more to be released like Street Fighter Arcade Edition, Dragon Ball Fighterz, Marvel vs Capcom Infernite, Tekken 7 and Injustice 2 can this simulation hold up? With all essential sports games, the visuals are fantastic and always have been for this series. However, this game made sure it would take it a step up by making sure every fighter had a facial recognition scan to make them look exactly like their real-life self. This would be nothing to brag about if the game had 50- 60 fighters but there are at least over 230 fighters in this game all done from the likes of future stars like Mickey Gail to current champions like Demetrious Johnson. The game has also added over 5000 new animations with some being unique to fighters from their stance, and walking motion around the octagon to simple jabs and blocking. Each opponent feels different to the other. No matter if you’re playing alone in the create a PPV mode, online in head to head or ultimate team mode you’ll always find enjoyment from this game. Playing friends in knockout mode (which includes snoop dog as an optional commentator), the new tournament mode or the many different mini modes like submission specialist or stand and bang this is the perfect couch game for you and your mates. Depending on how you play and who you use, this game is either a fast paced all out brawl or slow enough to make it a strategic battle. Due to this, there has not been a time I haven’t enjoyed a fight even when I lose. If I did lose the fight new stamina and control system makes it know why I lost and how I can avoid it next time. This has been done thanks to strikes now being able to be thrown from any movement. No more standing still to throw a jab if you want to move back and throw a punch to create distance you can. If you’re going to swerve to the right and throw a hook while missing your opponents uppercut you can. This freedom makes combos so much smoother and more comfortable to pull off in game. For me, this game is most enjoyable in the tournament mode with a group of friends around your house. The pure trash talking and hype you and your friends have when you land a knockout punch from nowhere, or you land one of the many acrobatic kicks is just fantastic. Mainly if you use the new stand and bang rules which disables clinching and takedowns leading to an all-out brawl that reminds me of the fight night series. Where the career mode in UFC 2 became stale after just a few fights, this version was able to keep me entertained for longer with the new management system between learning new moves, training my stats and promoting my fight. I felt that this system was engaging and lead me down a few paths in my quick play through. I had one fight that even though I was on the undercard, it was the most hyped match thanks to my promotion work. However, I did not train my guy in defending the ground game leading to my opponent controlling the fight with me getting a lucky 3rd round knock to scrape a win. However, on the other aspect, I fought against a ranked opponent that I trained all the time for lead to a quick 1st round knockout, but due to the lack of promotion, no one was interested leading to fewer fans being gained along with less money. 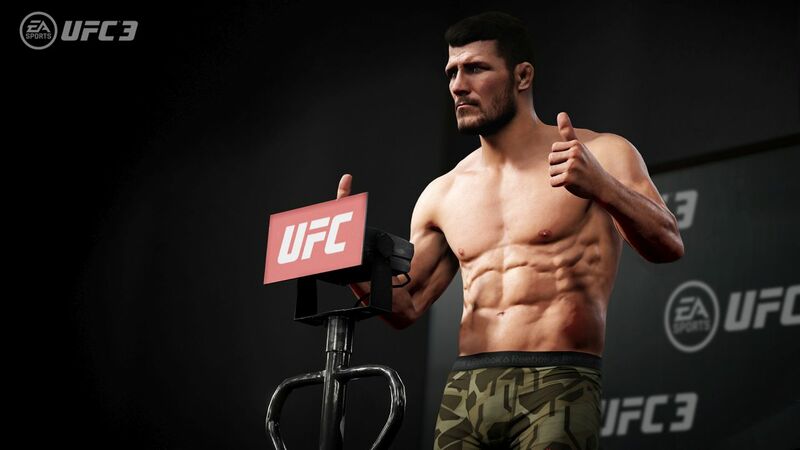 Therefore learning a balance or deciding what is essential, as well as the many cut scenes including press conferences weigh-ins and the Dana White YouTube series of finding a fighter, made this mode the most compelling career mode in the series so far. However, I did find I was missing something in this mode and being honest I realised what it was when I went back on FIFA and Madden, it was a proper story mode. I know it’s terrible to say this as the career mode was fun it just the fact sports games have started introducing these story-driven modes into games now that allow players to feel like they are in control of a star. I felt this game had this missing. In fact, Fight Night Champions did this in 2011, and it was terrific as it put you in the life of a boxer from his Olympic days all the way to him winning the world title. The sad thing is even if people say that it does not need one because it a fighting game I say look at all fighting games that have been released since 2010 they all have a story mode as well as an arcade mode. I believe if UFC does this in the next instalment as well as keep the foundation of this career mode but add a little more that this will be the best single player sports game on the market. Apart from the changes in Ultimate Team, EA has decided to keep all the same modes from the last instalment of UFC these included friendly fights, online championships and Ultimate Team. For me, this was disappointing as I was hoping to see at least knockout mode get added online. Even a fighting camp mode in the style of pro clubs where fighters from different gyms fight each other in a best of 3 or 5 to decide who is the best gym. Include divisions and rewards for winning fights and EA could have had a much more compelling online mode. The one online mode that saw changes that was much needed was Ultimate Team. In the 2nd instalment of the series all, you could do was open packs to find moves for your created character. This was fun until you went online and realise that each weight class had one way of putting the moves and height of the fighter to make it game breaking. When you learned this, the game became too repetitive. You would fight the same style of opponent every time in that weight class, so you knew how the fight would go. This time they decided to keep the create a fighter and the moves in packs but added real-life fighters that are put in 3 different levels of bronze, silver and gold. Thanks to this opening packs to get that big-name fighter almost becomes more addictive than FIFA. Unlike FIFA there is no vast market, there are only four cards every six hours that you can buy which is randomly given by the game. This makes packs the only way of getting these big names. The addition of Madden like solo challenges also allows people to get used to their new fighters before going online as well as getting rewards. This mode is probably the mode I will spend the most time in, and as of writing this I was in the top 100 in the Xbox leaderboard for ultimate team online divisions. The last issue I had with online was the lack of a simulation mode. For me, this is key as this game is a simulation sports game and not an arcade fighter. What I mean is there was a time where I knocked the guy down five times before knocking him out, in real life the referee would have stopped the fight ages before. I believe with the inclusion of a simulation mode as an option this game could have a competitive scene like madden, 2K and FIFA and would attract a lot of players and probably some UFC stars themselves. UFC 3 is the best instalment of the series yet with the improvements in visuals, career mode, animations and the general gameplay itself taking it as one of the top and most fun sports games in the market today. However, a few missing aspects such as a simulation mode for online or a proper story-driven mode stops it from being up there with one of the best fighting and sports games made.